A woman, Dilys Hadley, living on a very small monthly income, delayed taking her 16-year-old cat, Janet, to the vet for treatment for a bulging eye – an obvious illness requiring treatment. There was a tumour under the eye forcing it out. She was successfully prosecuted under section nine of the Animal Welfare Act 2006 and promptly became a criminal. Below is the wording of the beginning of section 9. You can see it is worded widely and so it is easy to be in breach of it…..
A person commits an offence if he does not take such steps as are reasonable in all the circumstances to ensure that the needs of an animal for which he is responsible are met to the extent required by good practice…. The RSCPA prosecuted her. What the RSPCA did not do, and what they should have done, was to warn her before prosecuting her to allow her time to take remedial steps. Dilys was about to take her cat to the vet, anyway. To prosecute her was unnecessary. She had delayed for too long because of money concerns. That is no excuse because people who have cats should factor in the cost. However, Dilys was of good character and long-term cat caretaker. 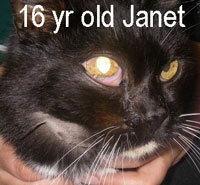 Also Janet, her cat, was not in pain, we are told. Dilys appealed the conviction for what was essentially a mild form of animal abuse. She lost the appeal but the judge criticised the RSPCA for being too eager to prosecute. Apparently the RSPCA had given an undertaking to the British Parliament that they would not prosecute until they had given a warning and the warning had been ignored. So, we have an interesting cat case in which we can see that it is possible to be prosecuted in the criminal courts for failing to take your cat to the vet for treatment when it is obvious that treatment is required. I presume someone – a neighbour perhaps – had reported the matter to the RSPCA. Beware cat owners. You could end up with a criminal record, a fine and even imprisonment for something that you might consider rather innocuous. Also the case highlights the overzealous behavior of the RSCPA to get people into court so that they can create publicity which they believe acts as a deterrent to animal owners who might otherwise tend to act irresponsibly or neglegently with respect to their animals. Final note: Janet had an inoperable tumour and was put to sleep. I expect her age was a factor – and the expense of the operation. This entry was posted in Animal Cruelty, Animal laws, cancer, Cat Health, Cat News, cat welfare, Human to cat relationship, Law, Moggie, Veterinarians and tagged Animal laws, Animal Welfare Act 2006, cat cancer, cat caretaking, cat health problems, rspca, veterinarians by Michael Broad. Bookmark the permalink. this reminds me of a case one of our volunteers advised on, a ladies catr came home injured 9.30pm on a Saturday night, there was no visible injury just something not right an the cat did what they all do she laid low, they noticed she was weeing while walking called for advise an of course got told to take vet. They too were short of money so had to call PDSA the vet on call wasn’t very helpful and a few harsh words were exchanged. They did manage to get cat to the PDSA a few hours later an lo an behold the RSPCA wanted to talk to them as accusation of not seeking treatment quick enough had been made by pdsa vet. The lady concerned stood her ground and RSPCA backed down. Another example of the change in policy of the RSPCA, which is being criticised by most people including, in this case, a judge. It is the person at the top. He needs to quit. yes good point Michael re leadership I just read post. must say I occasionally have my doubts about CP paid staff not coming from animal welfare background and seeing it as career choice. So next day he took him to the nearest PDSA, must be at least 30 miles from us, where they kept him in saying he would be stitched on the Monday, that worried me when I heard because as we all know, wounds need stitching when they are fresh! So of course an infection set in and the treatment was to cost at least £1000. Yesterday 10 days after the poor dog was injured, he was PTS. According to his owner the PDSA vet said they had no more resources for further treatment for him, he’d either have to go to a private vet and pay or be PTS! Now I don’t know if this is true or not as I don’t know much about the PDSA policies …maybe an article on them Michael as someone might know? To me the logical thing would have been for the private vet to have stitched up that dog when it happened, the PDSA to pay the £400 bill, but instead at least £1000 of kind peoples donations to them has been wasted because the dog is now dead anyway! In my vet nurse days, long ago now I know, but if an animal had been in dire need like that the vet would have treated him and the charge gone on the RSPCA account we sent out to them monthly. I wouldn’t donate to the PDSA because the people who use them often have cars, sky TV, the latest gadgets etc and why should other people give to pay for their choice of having a pet? In the end, as always it’s the animals who would suffer if everyone thought like me, but I’d rather donate to local cat charities and know the money will definitely help needy cats. so sad re rocky ;-( in reality the costs will have been much lower as pdsa vets I would think are salaried plus costs of medication will be cheaper as they likely have similar arrangements as franchise vets to bulk buy. ~They say Mrs Hadley should have taken it to a vet days, if not weeks earlier, and that she told their inspector she had not done so because she could not afford the fee. As noted above, the cat was 16 years old, and so Mrs Hadley had cared for her for 16 years. She had been taking care of this cat for 16 years. And, 16 years is a pretty damn decent age for cat longevity. If everyone who thought about having a cat had to think 16 years ahead and factor in all costs, totally unknown apart from food and some usual visits to the vet are behaving inexcusably, and had to think 16 years ahead as changing economic issues and rising vet costs (get out your crystal ball) that might affect their ability to maintain the cat in order to pass your “should” test, then most who take on cats would not pass your test. The cat had an apparently good 15 years. That is a positive. I take your point about 16 years being a good age and it being difficult to factor in things 16 years ahead and I may have been too tough but I still tend to believe what I have stated. We know that cats, like people, are likely to get ill when older. I don’t think it is hard to factor that in and 16 years of age for a moggie in the UK is about normal. Dilys’s failing was that if she had taken Janet in to the vet earlier for a consultation and advice about her eye, Dilys would have probably been told that it was inoperable then and Janet would have been euthanised. That would have avoided large vet’s fees and the RSPCA visit and prosecution. We have to be critical of Dilys in not dealing with an obvious health problem. Her conviction still stands. She got a “conditional discharge” meaning neither a fine nor a prison sentence but if she goes wrong again she’ll be brought back to court and fined for this offence. I think people should factor in increased vet fees when their cat become old and assume that their cat will reach standard old age for a cat – about 14-18 for a moggie in the UK. Purebreds have shorter lives. I have to agree with you Valley Girl, we can’t look sixteen years ahead and know what our financial situation will be. As I already said, if I lived alone I’d be struggling as would my sister even though she goes out to work. How could she have known that she’d be widowed at only forty nine and have to rethink her whole future? How could I have known that around the same time my life would become so unbearable at the family home we owned, because of cat hating neighbours, that we’d have to find this rented house together and factor paying rent into our financial situation? We had thought that house was our security for our lifetimes but we had to almost give it away to pay off things we hadn’t bargained for! No one would have bought it for much because those awful people ruined a previously quiet street (and still are) but also while trying to sell it we had the misfortune of a burst pipe in the attic which flooded the house and ruined the carpets and wallpaper and the electrical wiring too. Fate can be very cruel and because we have had money worries and life uncertainties I do understand Dilys position. It doesn’t excuse her, she should have taken Janet to the vet earlier, but I expect she is now saying over and over in her mind ‘I wish’ and by the feeling of guilt she must feel she will be punishing herself. The RSPCA are too quick to prosecute the wrong people while some people get away with very poor animal care, I could tell you of someone right now who they passed as an acceptable carer and one of his dogs has been very badly injured by another, he’s getting free treatment at the PDSA yet he has Sky TV, all the latest gadgets ……he can’t afford vet care for those dogs and knew it when he got them! Dilys didn’t know when she got that kitten that she would develop a serious condition, where was her daughter, why didn’t she encourage her to go to the vets earlier? I’m only saying that it’s not fair treatment by the RSPCA to target one person while others get away with bad animal care! I agree that we cannot plan financially for the longterm and I also agree that the RSPCA were out of order in prosecuting her. Completely the wrong thing to do. It was bad luck for her because there are many far worse cases in the UK which go unprosecuted. It is a bit scary that a neighbour could “shop” you to the RSPCA just because your cat wanders into their garden and happens to look ill. I do feel though that all cat owners should expect some sort increase in vet’s fees when their cat becomes elderly. I have a feeling that people shut that prospect out. Vet’s bills are quite frightening to many people. I would bet my bottom dollar that many cats are not taken to the vet promptly enough or at all due to vet’s charges being too high or the uncertainty of what the bill will be. Yes I’m sure you are right Michael, we put money aside monthly for our cats vet bills but even so they cripple us. Jozef’s allergy has cost us a fortune and last time we went, merely for a check up, they charged £24. We’d never let our cats go without any treatment they needed, we’d rather eat bread and jam for all our meals, but to some people their cats are not a priority. Yes I think many who have been very good caretakers go into denial that old age often brings cats problems, some serious, I truly think that’s what Dilys did. I hate to say it but cats can be quite expensive. Vet’s charges scare me a bit and I have a bit of money. Ruth, I don’t know if you saw my comment above to you. Although we can’t know what was going through her mind, I very much agree with your statement as a totally plausible explanation. I very much agree. It wasn’t denial about vet bills (and you never implied that) but denial about the emotional issues involved in losing a cat, especially if one is older. Ruth, she is a retired professor. She lives in the US and she is planning to come over to the UK for a visit to meet me. I hope it works out. Oh I hope so Michael! She sounds a very nice lady and very intelligent too and most of all, a cat lover! Although I’ve seen noted the costs to the RSPCA for pursuing this action, one thing I would like to know is how much it cost Dilys once she took the cat to the vet. Previous discussions here indicate that vet costs are quite high. VG, she didn’t approve an operation. Her cat was put down because the tumor was inoperable. That costs about £50 in the UK or less which she presumably could afford. Okay, then perhaps £50 is not an onerous cost. Even if one’s income is £160. As you point out, it is more complicated. Trying to consider her point of view, not sure she would have been able to predict the cost beforehand, not knowing what the problem was. The PDSA exists for people on a low income Valley Girl and an intelligent lady like Dilys would have been sure to know about them, the cat would have been treated or PTS free of charge to her. £!60 a month teaching pension would disqualify her from pension credit to top up her state pension so she would struggle to pay out £50 on her income, living alone, all the household bills to pay! £50 IS a lot to a pensioner. If I lived alone I’d be well struggling. But I do agree Dilys was harshly treated by the RSPCA because her cat had obviously previously been well looked after as she was a good age. Maybe she was in denial, couldn’t bear the thought of a vets visit, was frightened what the vet would say. The RSPCA could have warned her to go to the PDSA or they’d take it further. Ruth, I thought a lot about this story, and my comments above and below. I couldn’t get it out of my mind while trying to fall asleep after reading. Without having read your comment that I am responding to now, I finally thought that the most likely explanation was that she was in denial. The two different statements I read (paraphrase) “I couldn’t afford it” and “I was waiting for my daughter” did add up to me- things that one might say in an effort to defend oneself in court. And, I was thinking about how difficult it is for humans to deal with the loss of beloved cat. I think they could have given Dilys a warning because she probably wouldn’t have realised her cat’s condition was so serious. Instead they are wasting donations given by people to help animals, by having to pay legal costs instead for this court case. We never give to the RSPCA nowadays! Yes, Ruth the RSPCA wasted about £10,000 on defending Dily’s appeal when they were at fault in the first places for prosecuting her. Bad policy decisions. The RSPCA needs to go back to their old style way of working: attending to the welfare of individual animals and helping people. I agree Ruth – court costs a load of money. I hate seeing peoples hard earn donations being spent on lawyers (no offence Michael) – I think the idea that you should get in trouble for not looking after your cat is a good one but I think the RSPCA could have done it differently and given the exact same message. The message is good but the means is not. So sad. I’m glad, at least, that Janet wasn’t in pain. In my opinion, the RSPCA should have been of ASSISTANCE to this woman instead of going for her throat. Also, if the judge felt the RSPCA acted too hastily, he should have overturned the ruling. I guess that negative publicity is better than none in the minds of big organizations. Well said. The judge did “punish” the RSPCA by not ordering their legal costs to be paid by Dilys (in the appeal). That is not much because she couldn’t pay anyway. The RSPCA has become too litigious, meaning too keen to take people to court. As you say some good advice and a warning would have saved a lot of heartache, court time and legal costs. It is a stark reminder though that a neighbour could inform on you to the authorities if you don’t look after your cat leading to harsh consequences. If that’s the attitude of the RSPCA then I hope people stop giving them donations. They must betaught to respect people and understand the difficulties they may have. They live on donated money. Nobody donated anything to Dilys. They have become way to political and not helpful. It has gone wrong and its the chief executive’s fault (perhaps).